No one knows at what turning point in fate one’s fateful hour will come and what exactly will take us from the earthly world to one whose form we do not know. Nevertheless, there are some people on earth who can see this moment coming. Mystical and unfathomable intuition is what allows people to find the key to this impenetrable secret. There are a huge number of similar examples. American doctors William Green, Stefan Goldstein and Alex Moss, studying the phenomenon of death, researched thousands of stories behind patients who died suddenly. Their results show that most people had anticipated their own death. Admittedly, their premonition did not come in the form of prophetic statements or timely preparations for their burial, but in a specific psychological state and often in the desire to put their affairs into order. It emerges that shortly before their death many people experience a state of depression which can last anything from a week to half a year. Medics assumed that this strange melancholy is caused by hormonal changes in one’s organism. The psychological feature of this apparently groundless despondence is to prepare the central nervous system for the inevitable parting from life. This corresponds with the opinion shared by many researchers that death is merely the transition of consciousness into a different form of being, to an energetic plane of existence. However, why does the organism need this “psychological preparation?” Surely it cannot be just to find out whether everything will soon come to an end, once and for all. How can people’s strange ability to foresee death be explained? The Tibetan Book of the Dead offers an answer to this question. According to Eastern beliefs, a person is a being consisting of both thick and thin matter. Thick matter forms the physical body of a person. Thin matter makes up one’s spiritual nature, in particular, the thin body, invisible through normal vision, forming the unique covering of the soul. Death is nothing other than a separating of the thin body from the physical. The thin body has its own aura which clairvoyants are able to see. Radiation emanating from this aura allows one to diagnose the state of a person’s health. Aura diagnosis has long been used in extrasensory healing. People who have astral vision can predict a person’s death from their aura. But why do people have to experience this terrifying premonition? Has nature instilled any meaning into this signal? There is an interesting hypothesis in this respect. Scientists have long since known of the fact which became apparent in laboratory research: before dying, cells of a living organism emit a sudden surge of radioactive rays. The Polish physicist Janusz Slawinsky surmised that this fairly powerful stream of waves can contain information on the life of a dying organism and can also save fragments of consciousness and memory. Is this the main purpose of the last signal given off by dying cells? All spiritual teaching talks of the continuation of life after death. The aura which disappears before death, like any type of cosmic matter, does not decompose without trace in space. Together with a person’s energy complex (the thin body), it carries over into the other world all information about a dying creature, in other words, its consciousness. 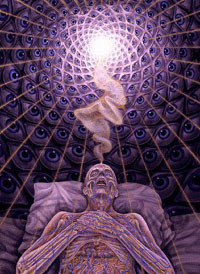 It is only the physical body that dies, consciousness continues to exist as a cloud of energy. Radioactive emissions from biological tissues at the moment of death seemingly give the thin body one final jolt, sending a person’s immortal soul into Outer Space.